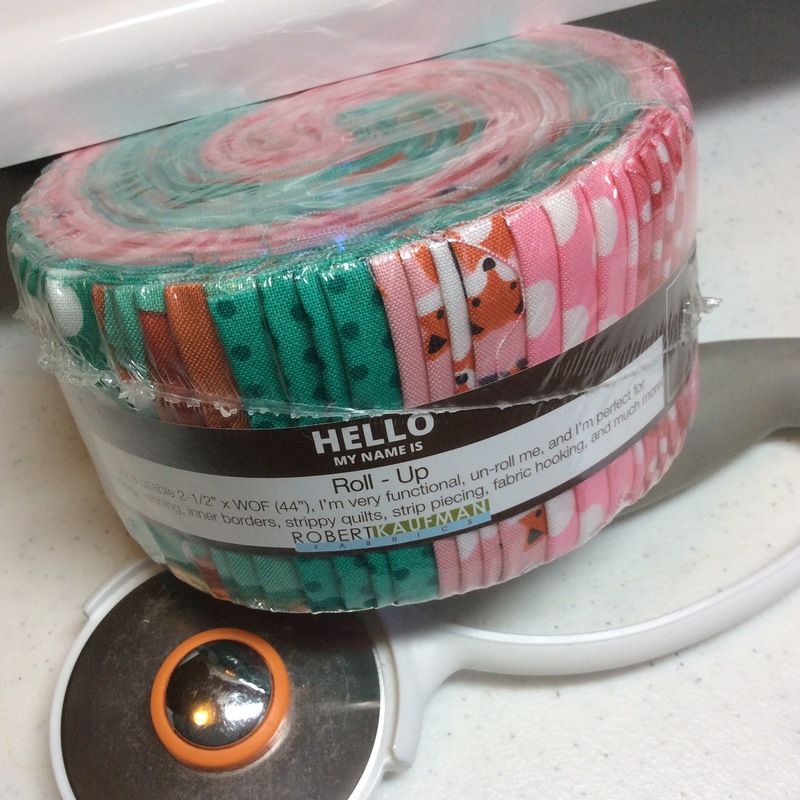 I broke open a Fabulous Foxes Jelly Roll to start on a charity baby quilt. 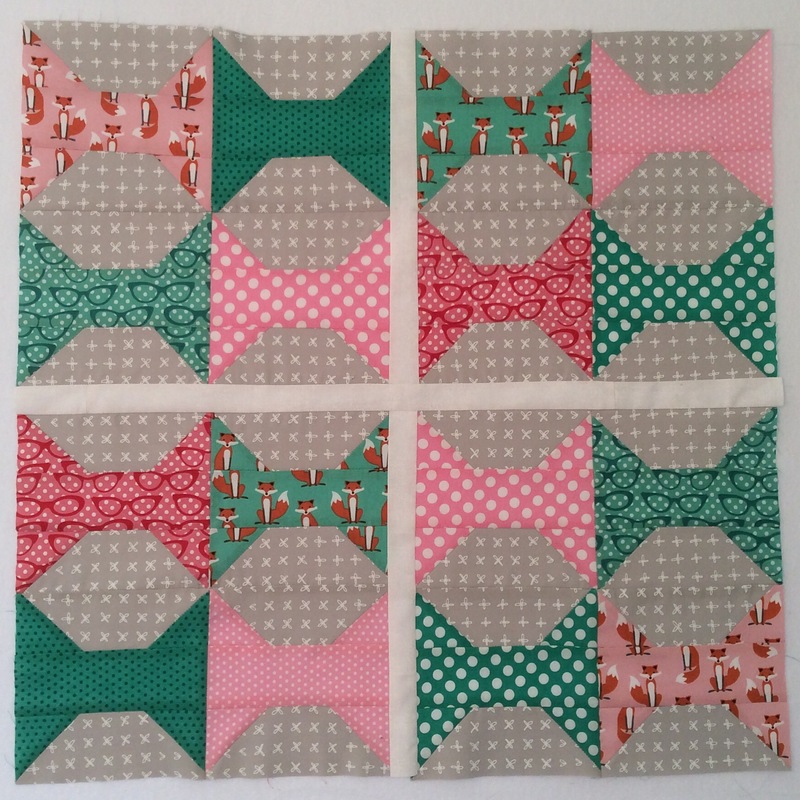 I had a free pattern sheet that I had gotten somewhere that was basically bows and thought this fabric would be cute in that type of quilt. 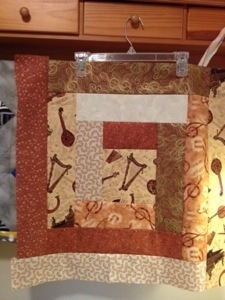 The pattern was also Jelly Roll friendly with 2 1/2 inch cuts. Here’s the first section completed. 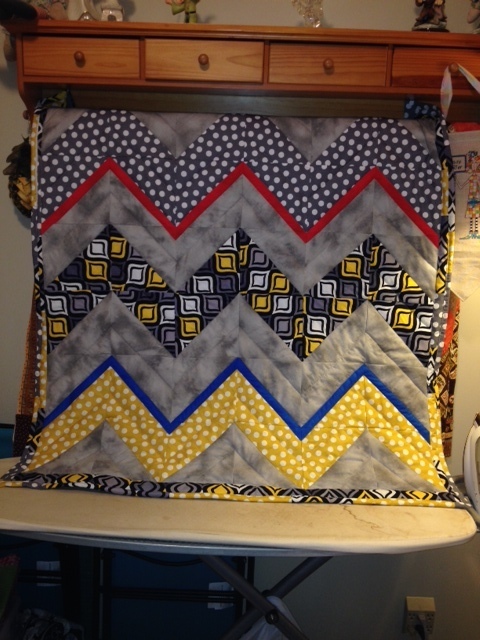 I did change it up a little from the free pattern, by Riley Blake Designs, and added some 1 1/2 inch sashing. The glasses on the dots just kills me! I love it. 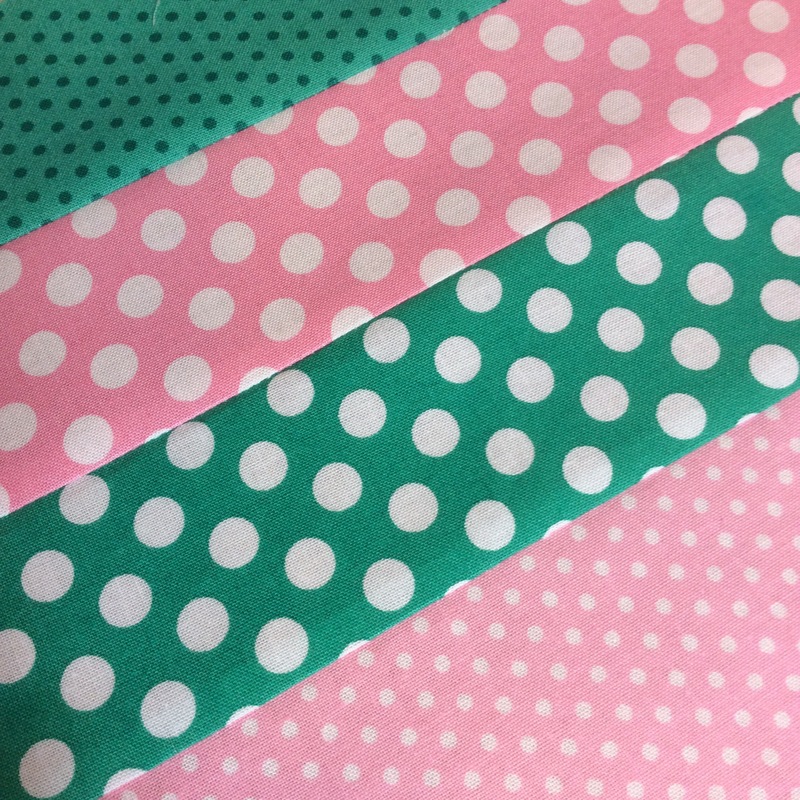 I’ve got more bows to make and then I think I will be adding some of these awesome dots to get it to the size I want. 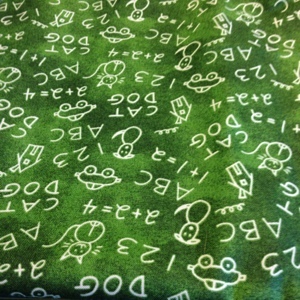 I may back it in this cuddle fabric that I picked up at the Hancock going-out-of-business sale. I think they would clear stock faster if they had a 1 yard minimum instead of a 2 yard one. 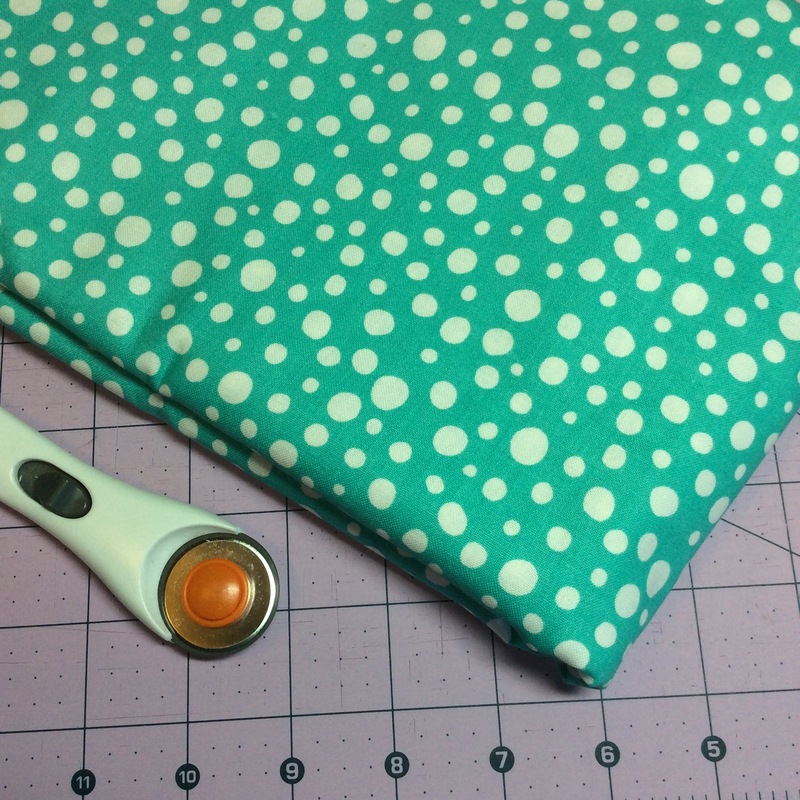 It’s easier to add 1 yard each of random prints to your stash than 2 yards. 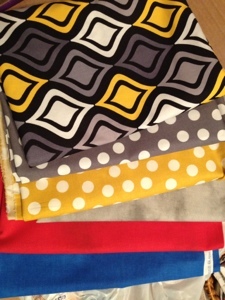 I saw some prints that I liked but not enough to get 2 yards worth. 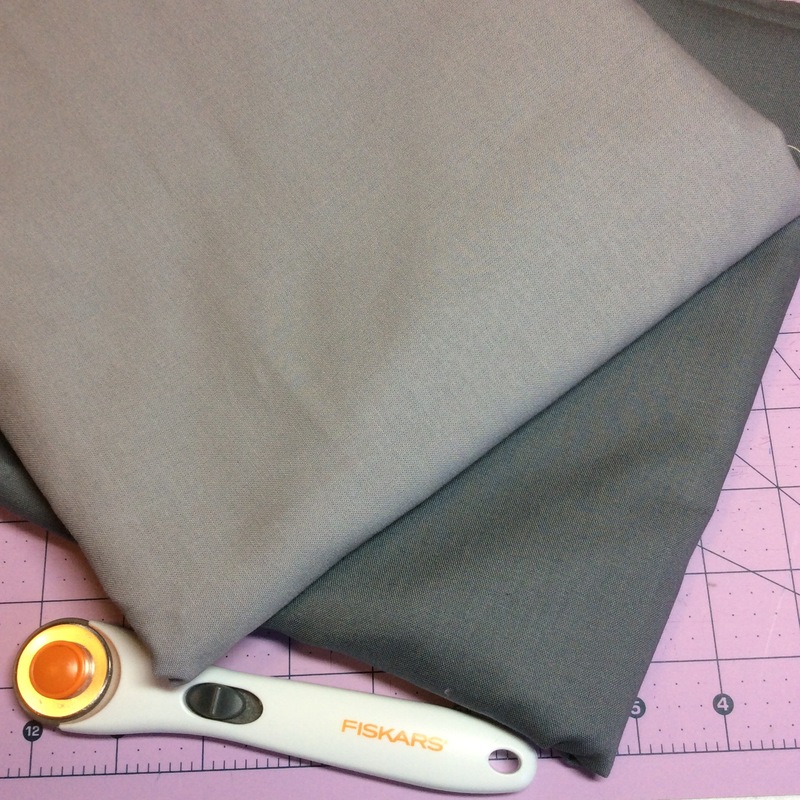 However, I did get some of my favorite Kona Cottons – medium grey and steel. 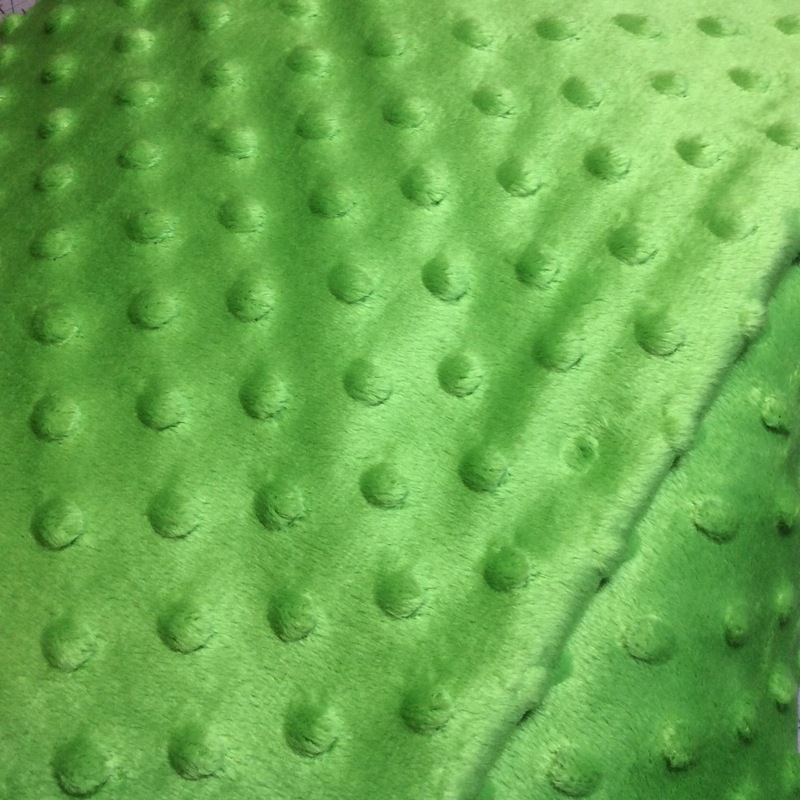 And these dots…. I thought they would be great for a lot of projects – there was less than 2 yds on the bolt so I got the End-of-Bolt discount as well as the 60% off sale. 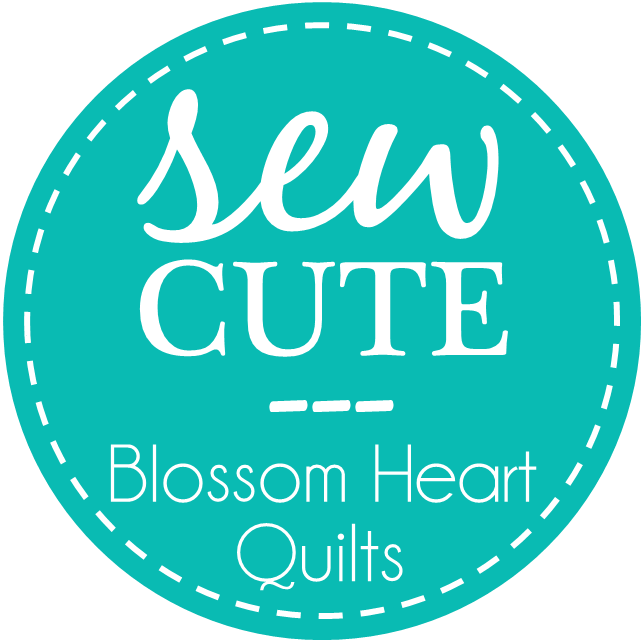 It’s time for summer sewing! 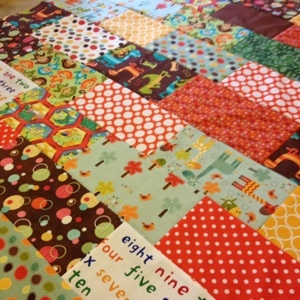 My quilt guild donates baby quilts to LeBonheur Children’s Hospital each year. This event doesn’t occur until late summer but I like to have a few ready to go. The first one for this year is made using a charm pack of Forest Friendzy. The little owls are so adorable. 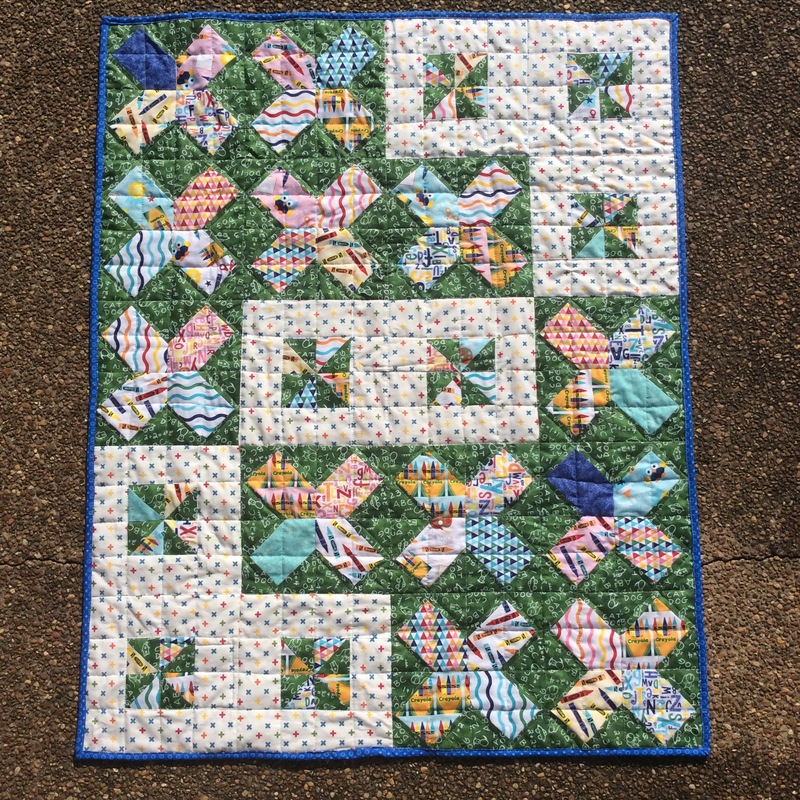 I used every bit of the Charm Pack and the sashing is from a jelly roll I had of Moda Bella Solids in Navy. 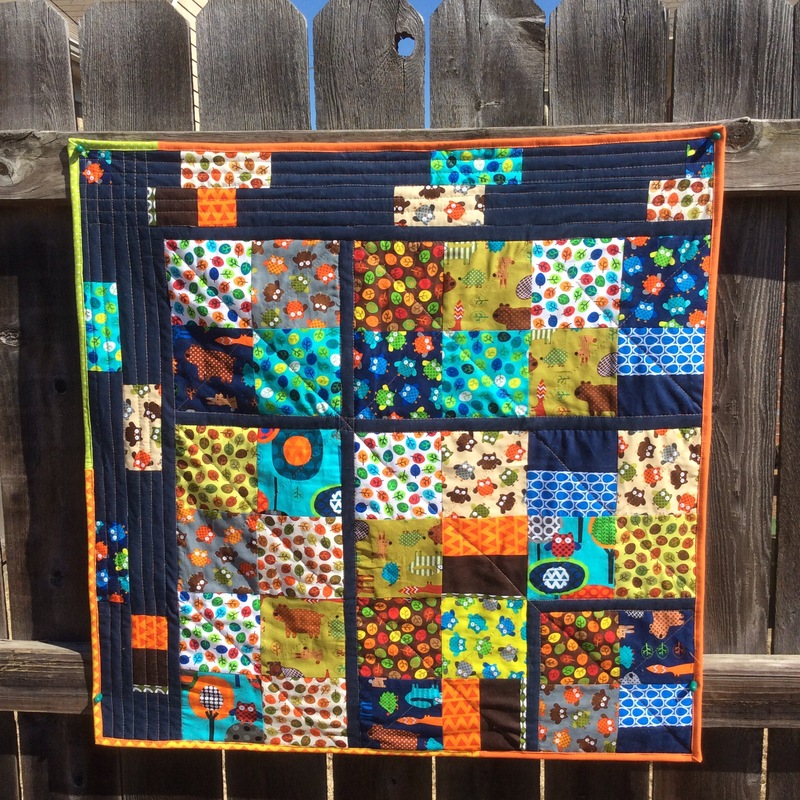 The colors are so vibrant and fun and I loved working with them. I used a solid orange binding with a little bit of green added and I’m glad I did as I think it lightens up the darkness of all that navy. 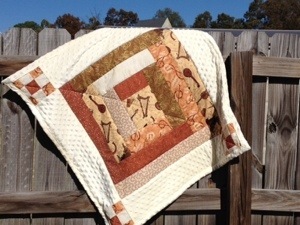 I quilted it using a variegated brown and backed with a mint and brown flannel dot print that was in my stash. 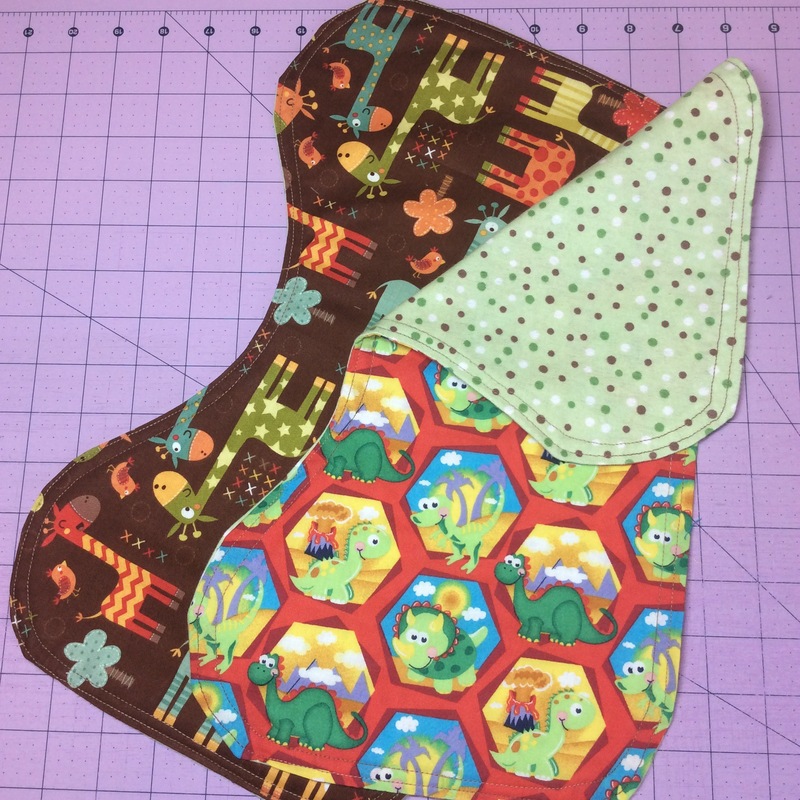 The flannel is soft and snuggly and worked really well with the colors on the front. 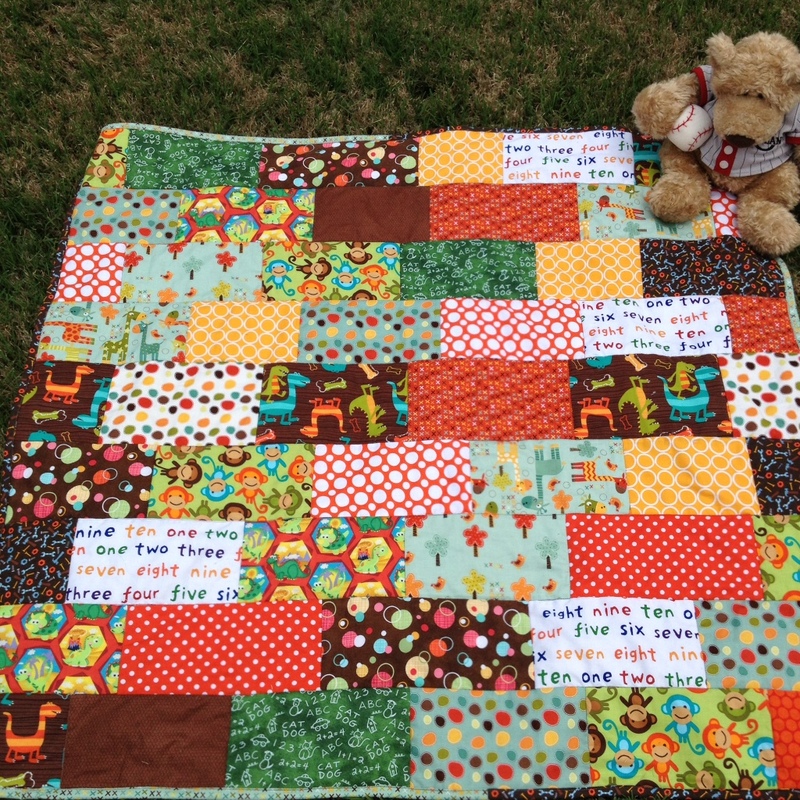 It’s such a cute little quilt and I cannot wait to donate it to this fabulous hospital. 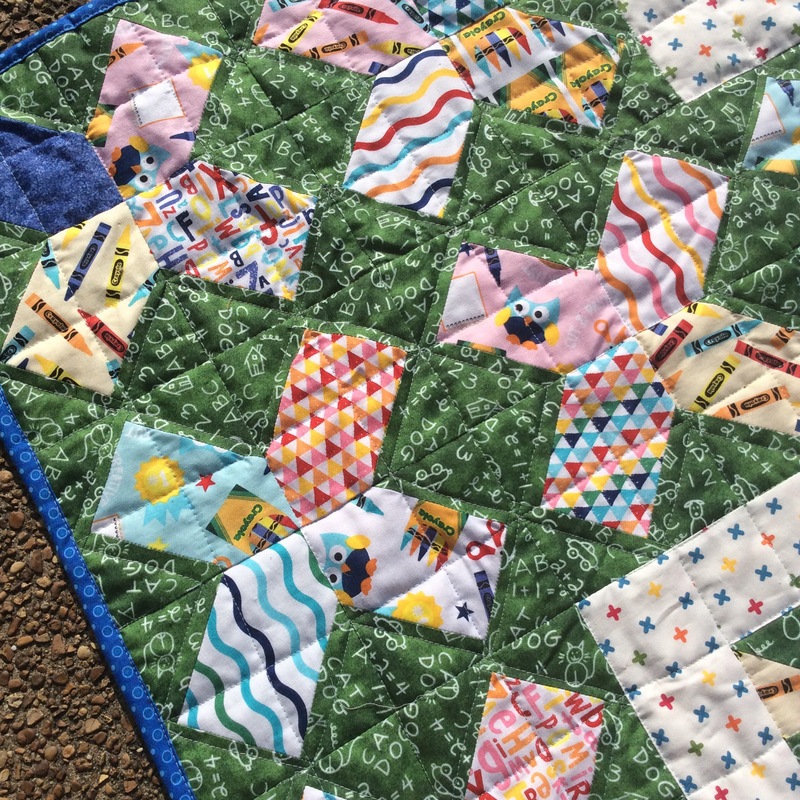 At my last guild meeting they handed out some fabric that we could use for one of these baby quilts so that should be the next one I work on. It will be fun to see what each member of the group comes up with. Everyone in the guild is incredibly creative but our styles are all a little different. 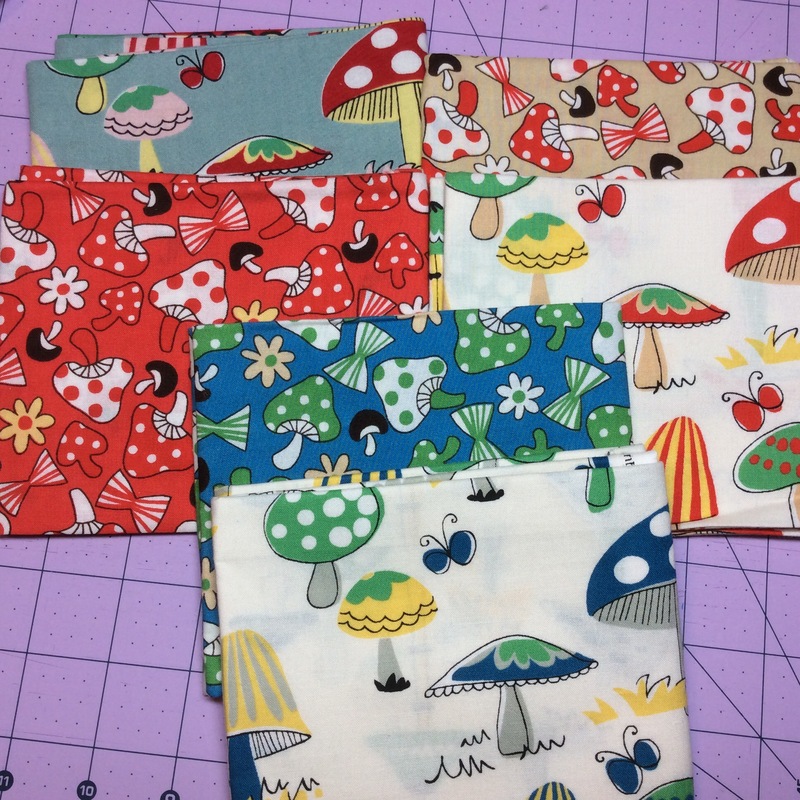 All the different mushroom quilts should make for a fabulous show and tell. I’ve got a couple of ideas and I really like the blue prints. This line is a bit retro and is slightly out of what I am attracted to but I love the challenge of the whole thing. I’ve got a few goals for March that I think I should be able to accomplish. 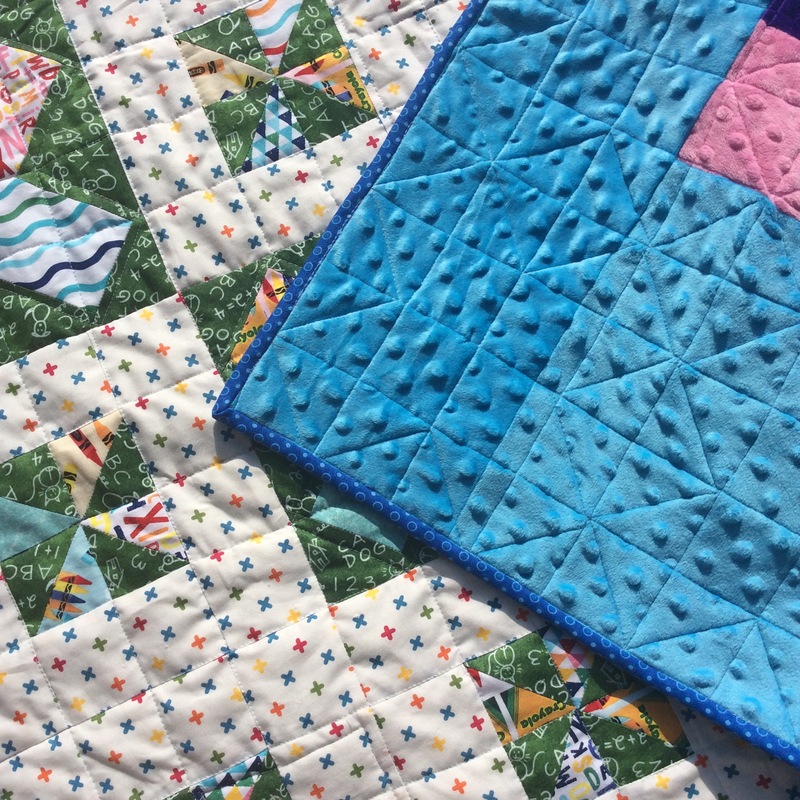 Baste, quilt, and bind the Wavelength quilt – I’ve got everything I need to get this done. 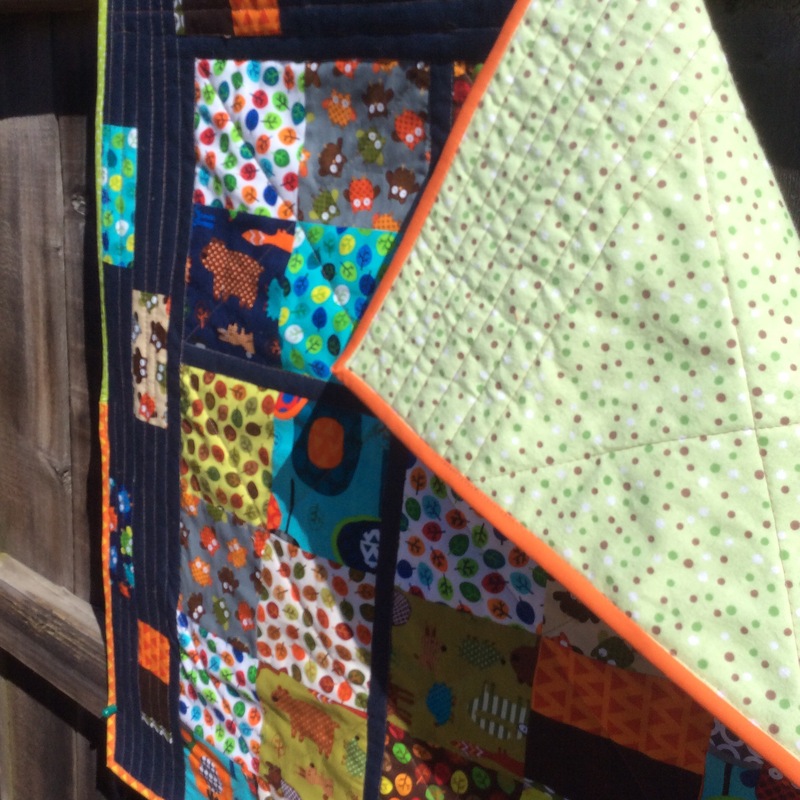 Baste, quilt, and bind the 2012 Crafsty Block of the Month quilt – it’s such a fun design and I adore the fabric I used for it – I have everything I need for this one, too. 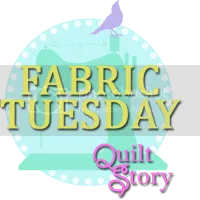 Go through my stash and give any fabrics that I no longer like to a friend who is just starting to sew. 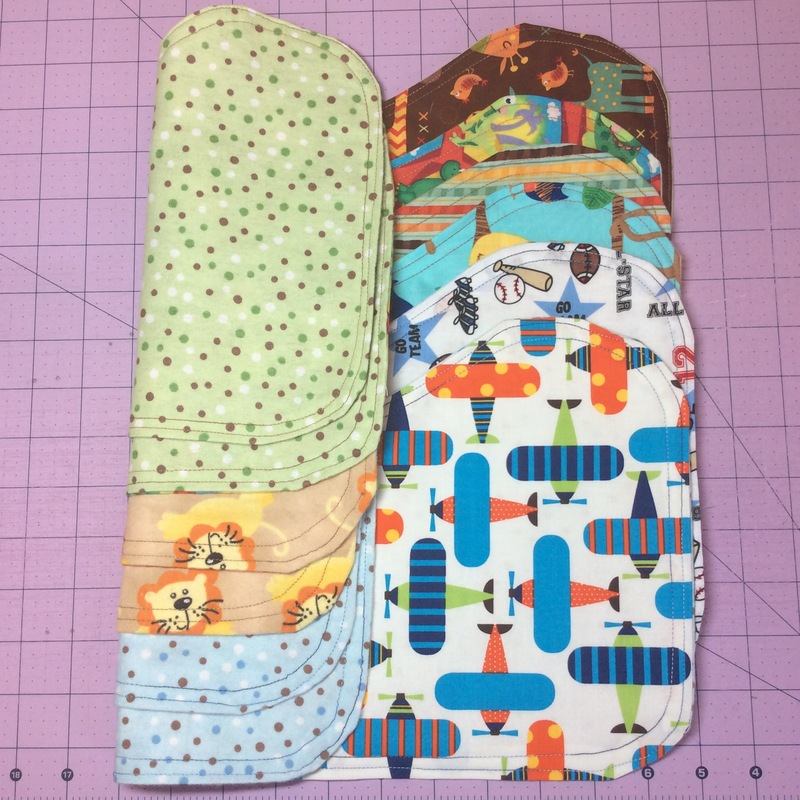 Use same stash and batting scraps to make small quilt sandwiches to practice free-motion quilting. I’m going to stop there as I know how I am and don’t want to overdo it. But, I do want to get a lot done before vacations start revving up in late spring and into the summer. 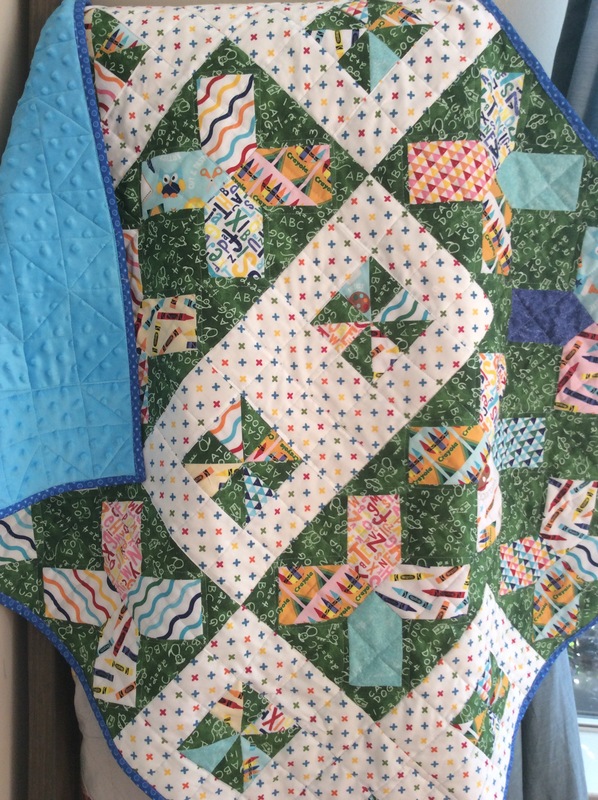 I recently finished a baby quilt to give to a friend for her cousin. I have never met my friend’s cousin but her story touched my heart. She is in her late 20s and has a 9 year old son from an old relationship. She is the type that never gets a break – broken home growing up, in and out of relationships with those that don’t deserve her, etc. From what I have heard she is a good person with a good heart. She works full-time at a small town bank and within the last year or 2 she met and married the love of her life. All was right in the world. She was in love and pregnant with her second child. She is currently about 7 1/2 months along. About a month ago her husband committed suicide and left her alone. She’ll have to raise 2 children basically by herself. She has joint custody of her oldest child but now no one to help with the baby. She has been overly stressed since the incident and the pregnancy may be at risk due to her current emotional state. My friend stated that her cousin had nothing yet for the baby. I felt I should help in some way. 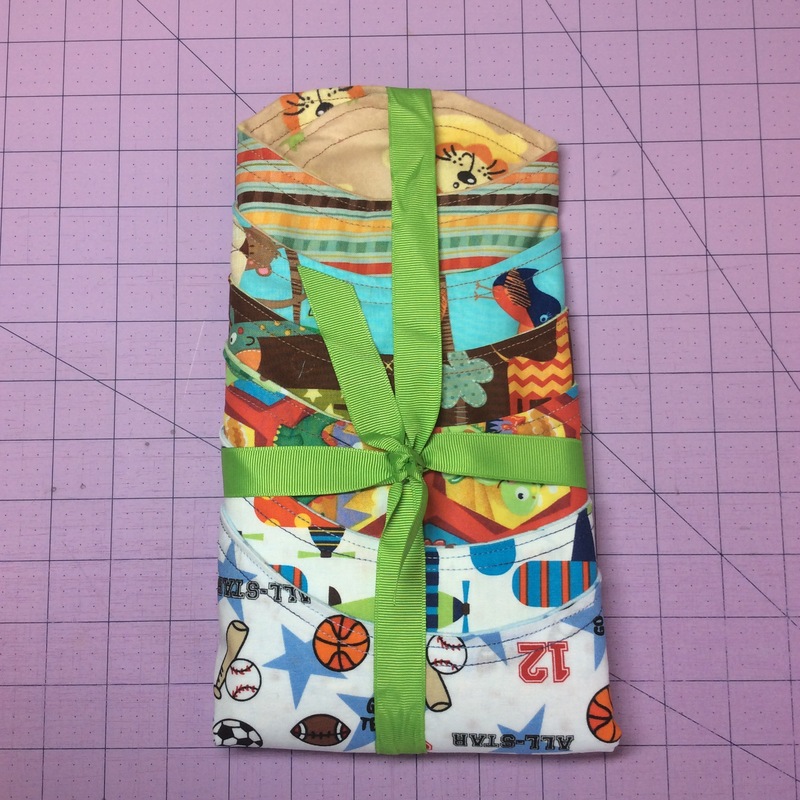 I didn’t have any baby stuff in the gift closet – time to restock that, right? 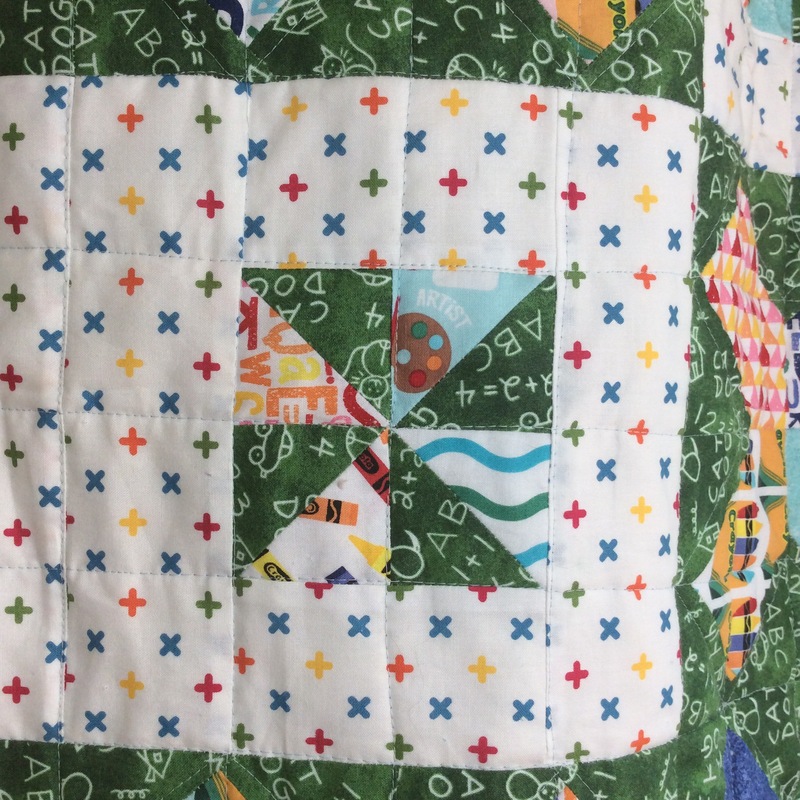 So, I decided to make her a quilt for the baby. The doctor has determined that it will be a boy. I recently purchased some Giraffe Crossing by Riley Blake from #thegreatfabricdestash on Instagram and the colors are just perfect for the design I was thinking of. Browns, oranges, yellows, muted blues. 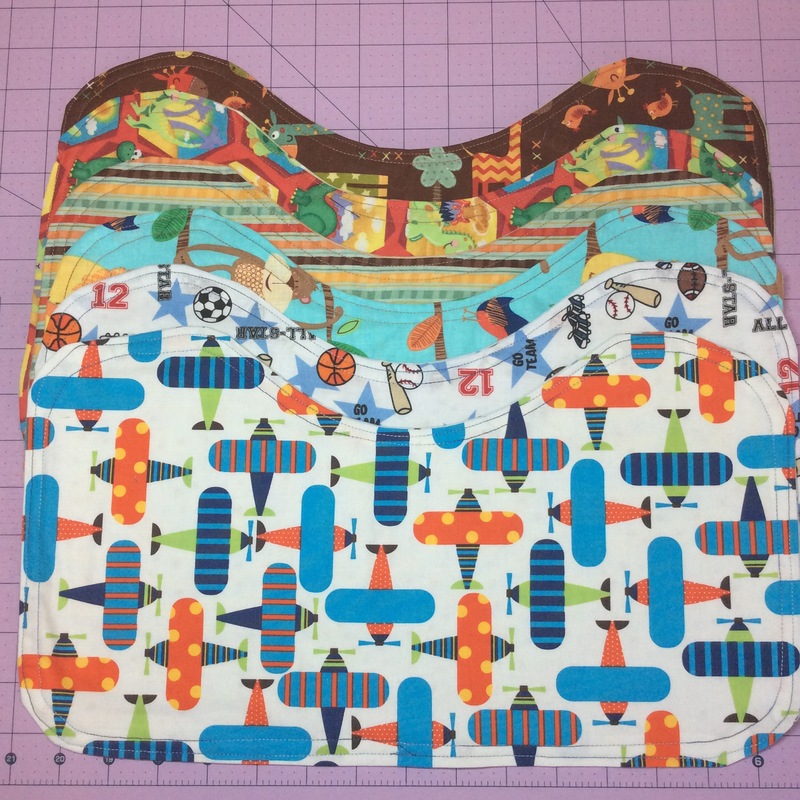 I mixed it up with some boy-centric fabrics I had in my stash that have dinaosaurs, tools, numbers, and letters. Don’t you just love this chalkboard print? I chose a brick pattern using 4 1/2 x 9 1/2 inch bricks and spaced the colors out to make sure I wasn’t doubling up on anything. 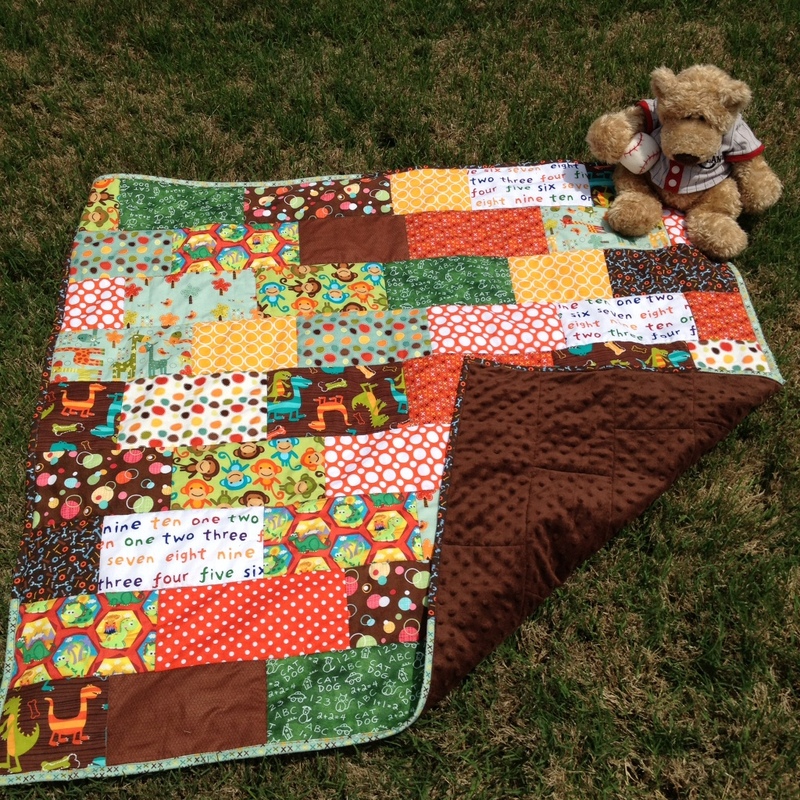 I backed it with dark brown Minkee and quilted with Stitch-in-the-Ditch. That Minkee is just divine and so soft and cuddly. I gave it to my friend to give to her cousin and I hope she is somehow comforted during this horrible time in her life. 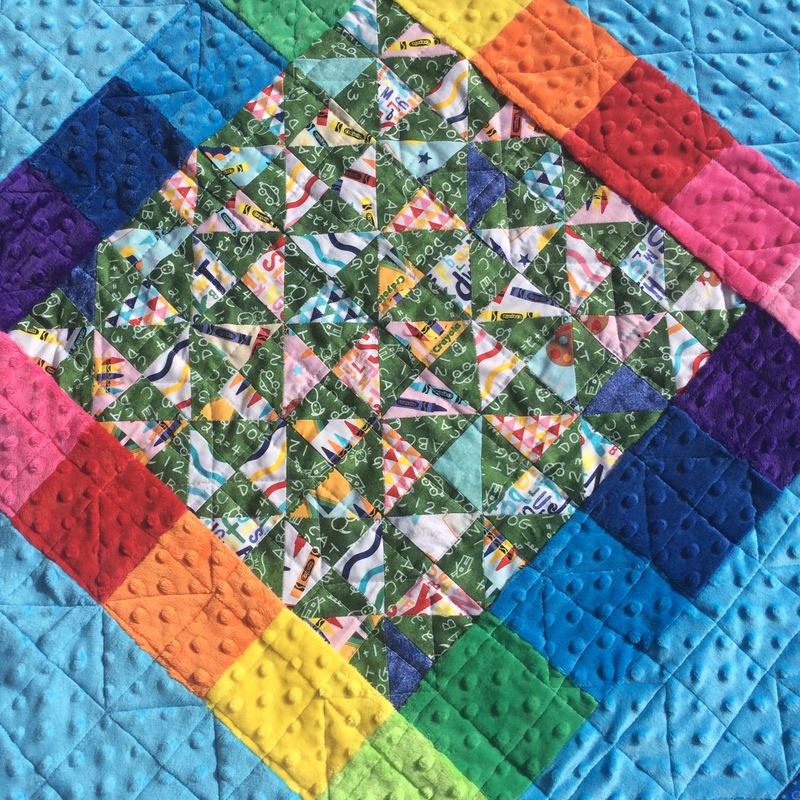 I’m entering this quilt over at the Blogger’s Quilt Festival – small quilt category – so be sure to head over there and vote starting on May 23rd. 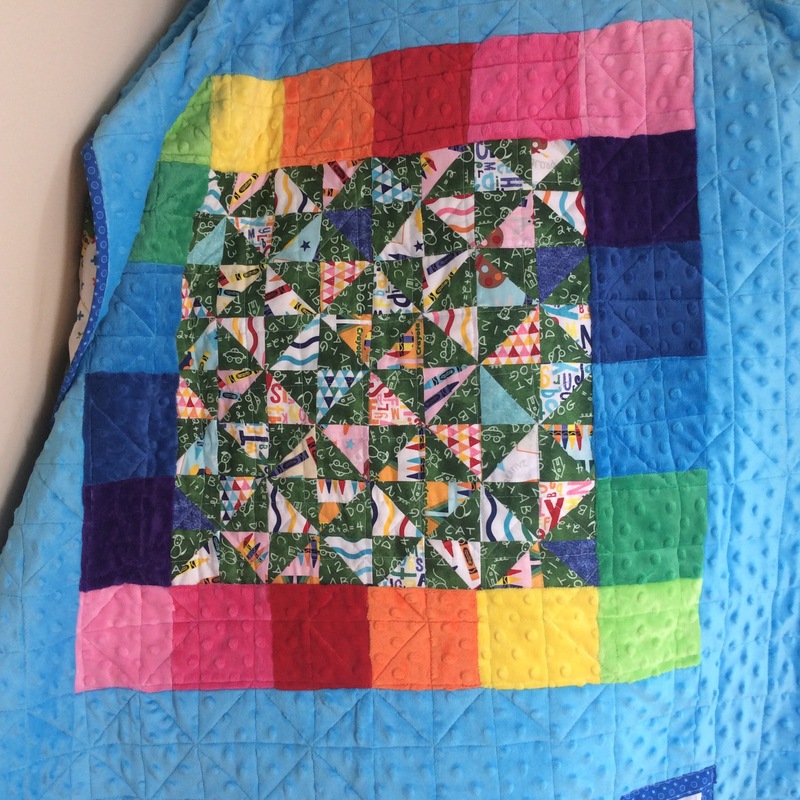 I was excited to hear about the Blogger’s Quilt Festival over at Amy’s Creative Side. 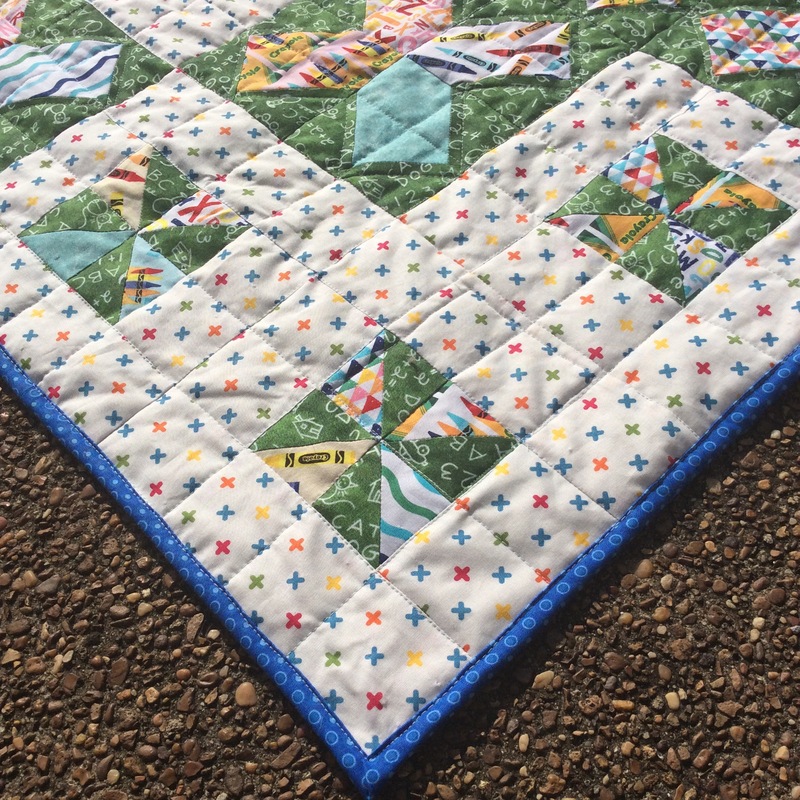 I have decided that I will enter my ‘Steeler’s Baby!’ quilt in the Baby Quilt Category. 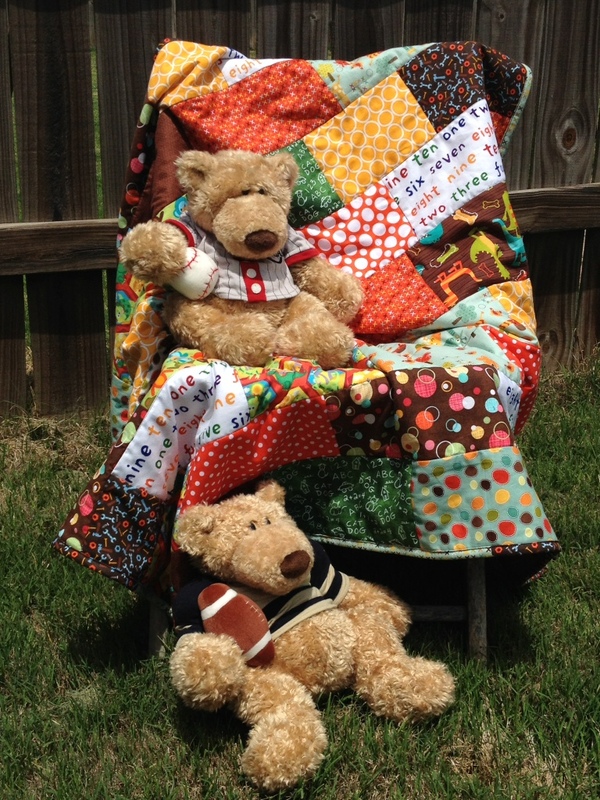 Be sure to head over there and vote for my quilt starting this Monday, November 28th. 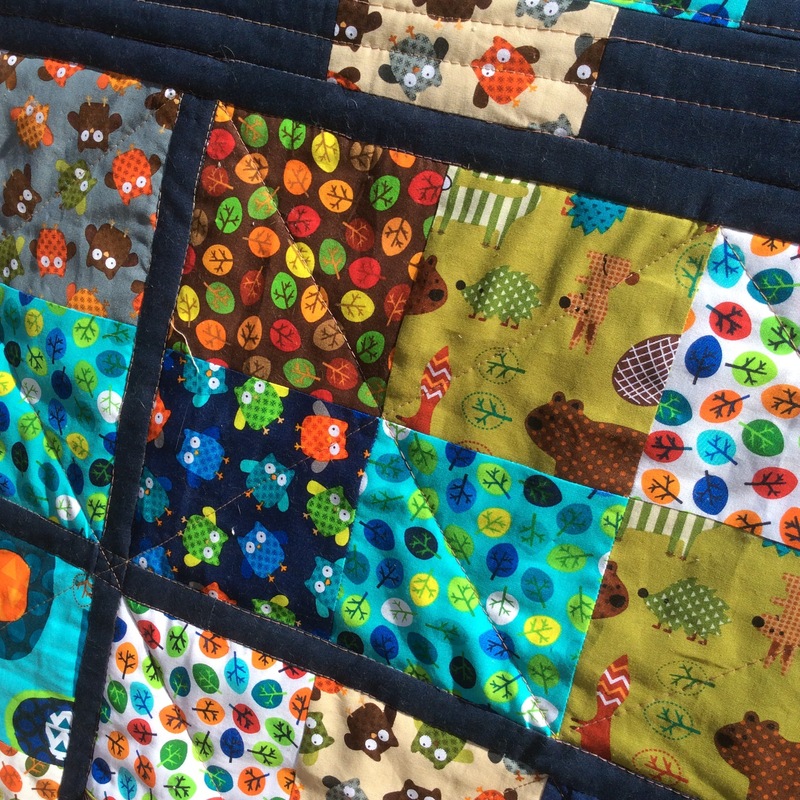 As you may recall, this quilt was one that was decided upon on a Friday and completed on Sunday by dinner. It was a whirlwind of activity that weekend. I have co-worker that is due next month. 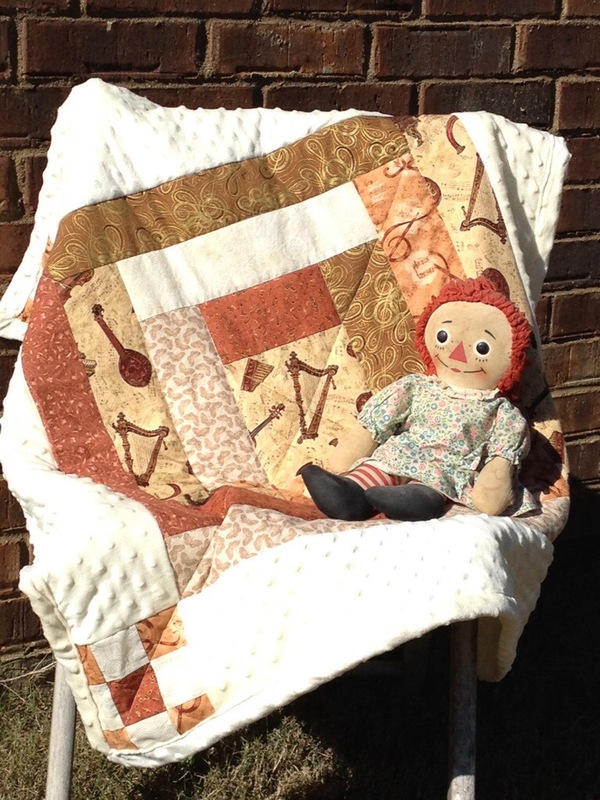 I’d been thinking about making her a baby quilt but just never committed to it. She is a huge Pittsburgh Steeler’s fan and I definitely wanted to do something that referenced that love but was not so much ‘in-your-face’ by using Steeler’s fabric. 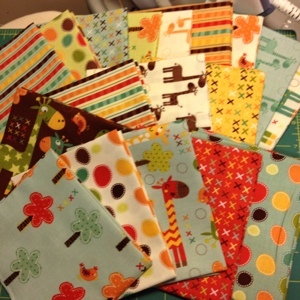 I hit Hobby Lobby – I just love their fabric selection – on the way home from work and found my inspiration fabrics. I went home and opened up EQ6 and started designing. That process is in a previous post. Then I started cutting and sewing my little heart out. I couldn’t believe how quickly it went together and I’m glad I made the decision to make it. Her shower is in 2 weeks and I cannot wait for her to receive it. 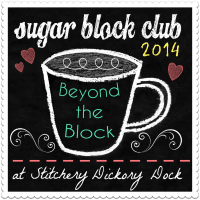 One part of the Festival allows me an entry to win a new BabyLock sewing machine. 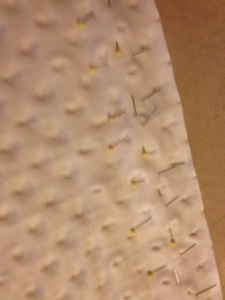 I can really use that so I can get access to more embroidery stitches to use when quilting. Very exciting!